Memberships at The Dome are a terrific and affordable way to support your employees! Your company can encourage healthy activity while minimizing overhead costs and HR workload. Use them at your employees’ discretion, or for group walks, team building events on the turf, and more! Use the 400-meter track for walking alone, with a friend, push your stroller, jog, or sprint as you build up your speed. Play the popular, smaller version of tennis featuring paddles and a lightweight plastic ball. The Dome features an all-new regulation pickleball court with painted lines on a hardcourt surface. The net is always set up and paddles are here for you! 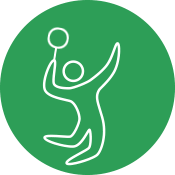 This racquet sport shares the same area as pickleball, featuring a regulation sized court and setup. No need to bring anything except you and a friend, The Dome has it all ready! We’ve got two tables always set up and ready for play. Paddles and balls are available at the tables themselves with plenty of room around them for active play. Use this specialized form of suspension training, made available for everyone regardless of their fitness level. Use our plyo boxes to load your jumping muscles and work on your vertical leap. Perform a variety of muscle toning and building exercises with free weights available to use as needed. Work on your functional strength with our new medicine ball kit. Stretch and work out your core with one of our yoga mats, cleaned and maintained for your use. Play this up-and-coming 2v2 fast-paced game that features a taut hula hoop-sized Spikeball net and ball. Available for drop in or free for members Fridays from 7pm-9pm. Build up your quadriceps and other major muscle groups with our squat rack and Olympic weights. Bumper plates are available for powerlifting as well. Pitch to a friend in our new batting cage! Use The Dome’s baseballs and bats, or bring your own. How far can you jump? Leap into one of our two sandpits along the track. Use your passes for employee group walks, obstacle courses on the turf, kickball, etc!